For good reason, garlic scapes are one of the latest culinary crazes. They taste just like garlic but have a different texture and ‘bite,’ after all they are the shoots of the plant. Springtime is usually when the garlic bulbs begin to shoot their ‘scapes’ up towards the sun. The ‘scapes’ are the shoots, or rather the flower bud of the garlic plant. Removing the ‘scapes’ allow the plant to focus it’s growing power on the bulb itself making better bulbs! So it’s not only helpful to the plant to use ’em, less wastefull and they also taste great. Take advantage when they’re availability, the window of opportunity is relatively small, they’re typically only available once a year! So, as spring arrives, keep your eyes open at your local grocery store. If you can’t find ’em, ask the grocery manager, he may be able to bring them in for you. 1. While bringing the potatoes to a boil for 1-minute, preheat the oven to 375F. 2. Remove the potatoes from the water and toss together with the scapes, chicken stock, olive oil, salt, pepper and (optional) hot pepper flakes. 3. Put the potatoes into a baking pan, add the butter and cook on 375F for about 45-90 minutes, mixing every 10-15 minutes or so. 5. 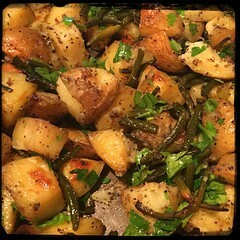 Remove the potatoes and toss them with the fresh flat-leaf parsley.